How many times haven't we wished to sleep just for half an hour after lunch? We can somehow manage on the weekends, but weekdays are a different story altogether! The reason for feeling sleepy soon after a meal is this: When we eat, the energy is diverted to our digestive system for digestion. This relaxes and slows down the rest of our body. • Have a healthy breakfast: It has been found that having a healthy breakfast prevents you from eating unhealthy food at lunch time and keeps your energy boosted from morning. • Avoid junk food for lunch: Junk food is filled with fats, sugars and calories which make you low and grumpy which is almost impossible to get out of! • Avoid heavy meals: More food means more energy required to digest it, which in turn, means less energy to your brain. • Avoid empty calories: Empty calories are sugars and refined flour which do not provide any nutrients other than calories. 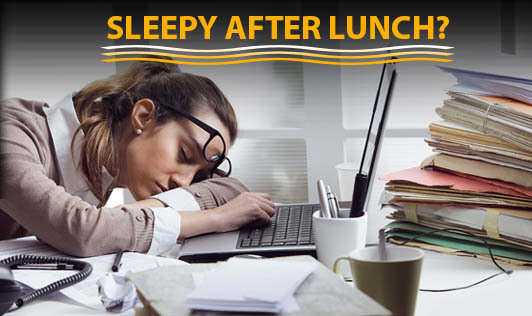 • Avoid alcohol at lunch as it is a sedative. • Avoid caffeine: Though caffeine is known to keep you alert, over time, you will have to increase the dosage of caffeine to keep you awake which is not a good sign. • Have a mid-morning snack: A small mid-morning snack will keep your metabolism high and will prevent you from over-eating during lunch. • Get proper sleep: If you are sleepy every day after lunch, it could be a sign of a lack of sleep. Catch up on your sleep to avoid sleepiness after your meal.